After reviewing what I thought was all of the restaurants which served pizza in Clarks Summit, I saw a tweet from Bazil informing me that they offer flatbread pizzas on their menu. 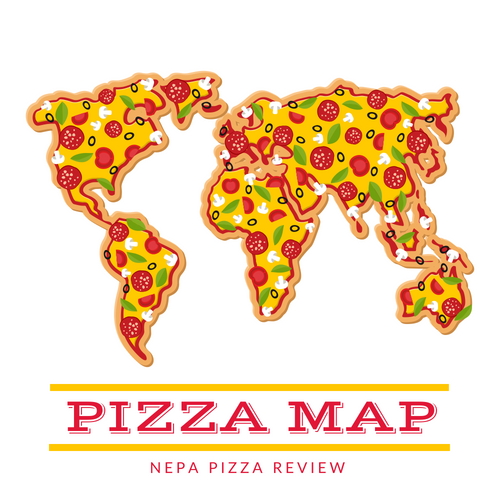 Although this created more work for me before I could create the “Top 10 Pizzas in Clarks Summit” article that I've been longing to publish, it also provided an opportunity for me to review a new type of pizza which I haven’t reviewed before. 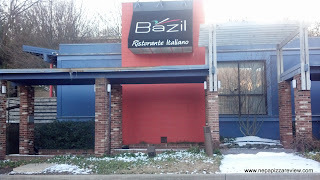 I tried to round out the Clarks Summit pizzas by heading over to Bazil for lunch one day, but found that they are only open for dinner during the week, which was a bit disappointing. On this day, when I was able to sneak in for dinner time, I noticed why they only serve dinner. The walkway to the front door before you enter the building forms a very cool patio where I assume the summer dining experience is simply enchanting. Walking in, you can immediately tell that this is a five star restaurant (well for me anyways, I usually stick to the more greasy spoon places if you know what I mean!). The place is formal, beautifully decorated, elegant, relaxing, with a full bar and first class service. It immediately made me think that I should be taking the first lady there for Valentine’s Day, but please don’t tell her because it will have to be a surprise! I was on a very strict time limit so I had to order quickly when the waiter came to my table with the menu, so I ordered the Zuppa de Pesci as an appetizer and the Bianco Mozzarella flat bread pizza. I went with the appetizer because I wasn’t sure if the flat bread would be enough to fill me for the rest of the evening, and I’m glad I did because the Zuppa de Pesci was incredible. I know I review pizza and not Italian food, but it warrants mentioning that this combination of clams, shrimp scallops, and calamari sautéed in plum tomatoes, garlic, and a wine sauce was out of this world. It was kind of like a seafood Fra Diablo without the pasta. 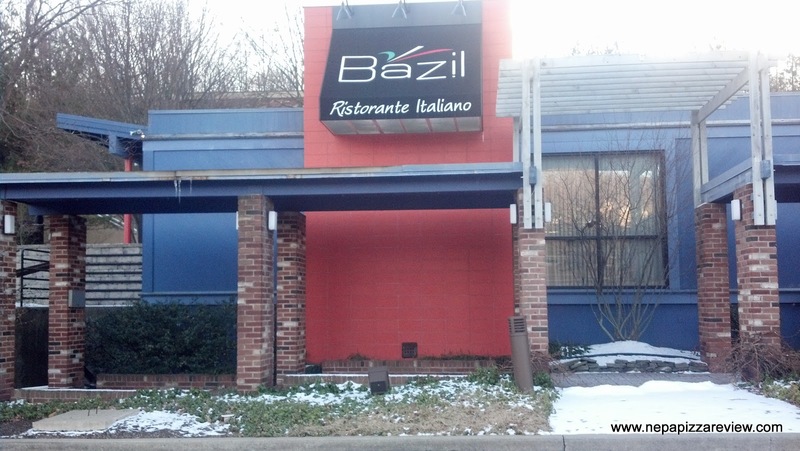 If you are into that type of food, I highly recommend you order this at Bazil! 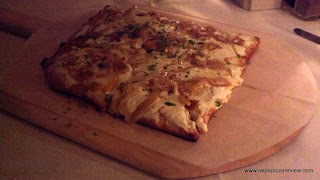 The bianco mozzarella flatbread came out shortly after my appetizer and as soon as I saw it I kicked myself for ordering it, as I knew I should have made such a hurried and hasty decision by selecting the top flatbread on the menu and assuming it was their most poplular. The flatbread that i ordered was more like a pirogi pizza, rather than your traditional sauce and cheese pizza. 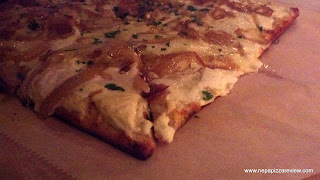 This pizza looked like a pita with mashed potatoes, cheese, fried onions, and chives sprinkled on top. Although I was disappointed in my choice, not necessarily the product that was served, I begrudgingly started my review. I tried to pick up a piece of the flatbread and was unable to do so in any neat manner, so I had to resort to a knife and fork, which I really don't like doing. The lack of crispiness and surplus of sogginess certainly is cause for a major point deduction on the crust. The mozzarella cheese, which may have been blended with some potato, really had the consistency of mashed potatoes and nothing more. There was some cheese sprinkled on top, which was presumably a low moisture mozzarella or mild cheddar which added some flavor, but not enough to spice up the bland mashed potato experience. I traditionally don't like fried onions, but I have to say these fried onions were spectacularly prepared. They were sweet, caramelized, and had an every so slight crunch to them that told me that the chef really knew what he was doing with them. Other than that, there was really nothing special about this pizza. Admittedly, I made the mistake of ordering a pizza I didn't want, but for $10 for this tiny pizza, it should have been cooked properly, had more complex flavors and textures, and left me desiring to try another flatbread. Overall, I'd call this pizza a clunker. I do want to go back to Bazil very soon, but not for flatbread pizza, but the fine dining experience and atmosphere. I also am quite excited for the summer time when I will get a chance to check out the patio! Nice write-up! Good thorough descriptions to give the reader a feel of the ambiance and the "pizza." It's sad when you get a sub-par dish from a restaurant you want to like. I think you may be too kind in your ratings; if this soggy crust gets a "2" (and 3 for crispy cooking) then what would be a 0 or a 1? Keep up the good work; I'm inspired to make a NEPA road trip to eat some of this stuff you've covered. Thanks for the kind words. You hit the nail right on the head with really wanting to like something that doesn't deliver. Point well taken on me potentially being too kind. I would love to have dedicated a whole paragraph to the crust and justifying the 2, but people would probably zone out and stop reading. Essentially, I liked the flavor, it wasn't terrible, but it just wasn't cooked properly. To earn a 1 it would have to be burned/raw or just a bad crust (tough, bland, overly salty, hard, etc.) To score a 0 it would have to be both burned/raw and a bad quality crust based on the perspective i use in all of my reviews.